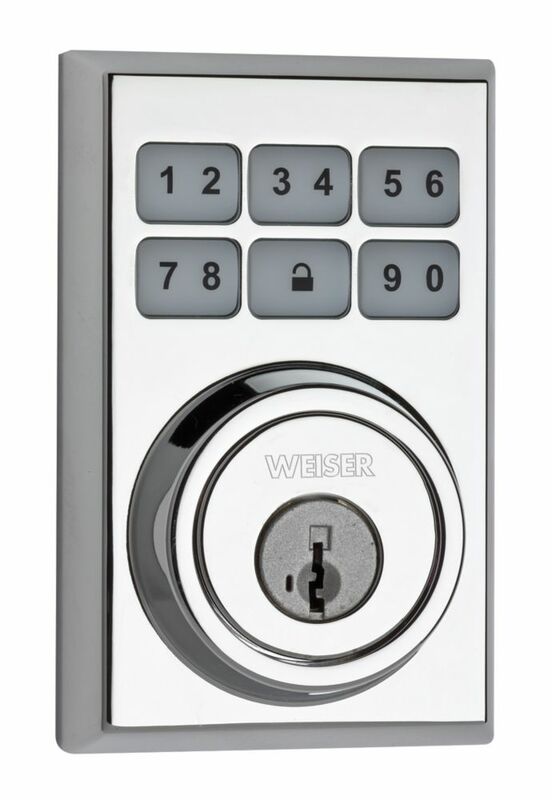 Weiser's electronic locks make getting into and out of your home simple, quick and secure. Using our convenient keyless technology all you need to do is punch in your code and the door unlocks. You can assign guest codes and be alerted when someone is trying to guess your code. SmartCode<sup></sup> touchpad electronic deadbolt is the only one-touch locking motorized deadbolt. With your personalized code, you can enter your home with the convenience of keyless entry and the back-lit keypad provides increased visibility. SmartCode is easy to install, program and use and operates on 4 AA batteries. It also features SmartKey re-key technology as the back-up keyway. This single cylinder deadbolt can be locked or unlocked by a key on the outside, or the turn button on the inside. The Polished Chrome is perfect for coordinating in a bathroom with polished chrome fixtures. Collections by Weiser offers five handlesets to choose from. These handlesets offer solid forged brass construction and Grade 1 cylinders for uncompromised security. The 3471 Contemporary Deadbolt Series exemplifies an ultramodern style with a subtle, low profile cylinder for an elegant appearance. Available in round or square shape, the 3471 series offers more flexibility in coordinating your door hardware.This single cylinder deadbolt can be locked or unlocked by a key on the outside, or the turn button on the inside. The Satin Chrome finish gives the product a modern and minimalist look. SmartCode Polished Chrome Keyless Entry Contemporary Electronic Deadbolt Weiser's electronic locks make getting into and out of your home simple, quick and secure. Using our convenient keyless technology all you need to do is punch in your code and the door unlocks. You can assign guest codes and be alerted when someone is trying to guess your code. SmartCode<sup></sup> touchpad electronic deadbolt is the only one-touch locking motorized deadbolt. With your personalized code, you can enter your home with the convenience of keyless entry and the back-lit keypad provides increased visibility. SmartCode is easy to install, program and use and operates on 4 AA batteries. It also features SmartKey re-key technology as the back-up keyway. This single cylinder deadbolt can be locked or unlocked by a key on the outside, or the turn button on the inside. The Polished Chrome is perfect for coordinating in a bathroom with polished chrome fixtures. SmartCode Polished Chrome Keyless Entry Contemporary Electronic Deadbolt is rated 4.0 out of 5 by 2. Rated 4 out of 5 by Pete8144 from Practical Entry I have two of these now. One on the garage and the other on the back door of our house. They both work well and the chrome matches the Weiser handle set we had in place. I would definitely buy again. Rated 4 out of 5 by JT 49 from Looks good ,easy to Install Very easy to install , operates easily. So far no problems in cold winter weather. Would have been nice to have keys light up when you operate in dark conditions though.